WHAT IS EXTREME GORGE SCRAMBLING? Gorge Scrambling or walking is a journey up or down a gorge, scrambling past waterfalls and pools over the rocks. There are all sorts of challenges to overcome when gorge walking. You will find yourself traversing along rock walls and jumping from boulder to boulder. As the day goes on you will be climbing waterfalls and sliding down water washed channels. There are squeezes to raise your heart rate and if that is not enough jumps into deep plunge pools. Getting wet is part of the fun and there are plenty of chances to jump into the deep plunge pools or slide down natural flumes in the rock into deep pools. 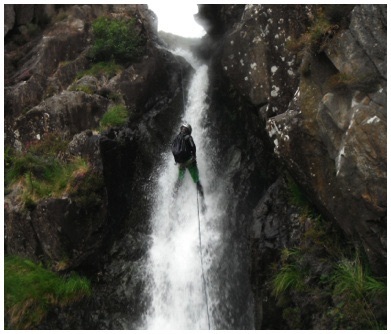 The difference with EXTREME gorge is that we will be abseiling down steep waterfalls and accessing steeper slides. You need to have come on a Gorge Scrambling day with us before we can attempt the more serious gorges with you. This is so we can make sure we are able to keep you safe. This isn't for everyone, it is for those who can cope with being cold; scared and who have abseiled before, a good level of fitness is required to get to the gorge over rough open mountainside...here is a sample of what to expect! have been in a gorge with us before.